Do I have GERD? Many heartburn sufferers worldwide ask this question. The truth is, that persistent heartburn the most frequent symptom of GERD. GERD related heartburn can be so severe that they are sometimes mistaken for a heart attack. While, GERD should not be taken lightly, heart attack requires emergency treatment. Basically, gastroesophageal reflux disease or GERD occurs when the stomach contents are pushed back into the esophagus and the stomach acid causes irritation and burning to the sensitive esophageal lining. The stomach is protected from the corrosive action of the acid by a thin layer of mucous but the esophageal lining has no defense mechanism. Frequent bouts of GERD can eventually lead to many serious health problems. The most common symptom of GERD is frequent heartburn also called acid indigestion. There is a burning type of pain in the lower part of the mid-chest behind the breast bone and in the mid-abdominal area. There is a bitter taste in the back of the mouth. Obesity, smoking, pregnancy generally precipitate GERD. Symptoms of GERD may also be triggered off or exacerbated by acidic foods such as tomatoes, citrus foods, chocolate, caffeinated beverages, alcohol, spearmint, fatty and fried foods as well as spicy curries. To answer the question "do I have GERD? ", find out if you have GERD, some gastroenterologists have devised the following questionnaire. - An uncomfortable feeling behind the breastbone that seems to be moving upwards from the stomach. - A bitter taste in the mouth. - A burning sensation in the back of your throat. 2) Do you often experience these problems after a meal? 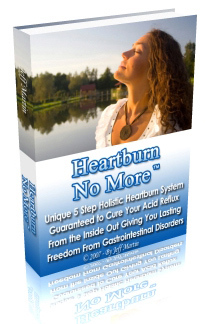 3) Do you experience heartburn two or more times a week? 4) Do you experience only temporary relief with antacids? 5) Do you take maximum dosage of over-the-counter medications? 6) Are you taking prescription medications ill experiencing symptoms? 7) Do you have trouble swallowing or persistent abdominal pain? If the answer to two or more of the above questions is "Yes" then you may have GERD and need to see a medical practitioner. GERD is a complex lifestyle disease with no one causative factor. So, treating the symptoms with drugs often defeats the aim of the treatment as the drugs offer only temporary relief and long-term usage may lead to aggravation of symptoms which are difficult to treat or dangerous side-effects. A holistic approach which will take into consideration the mental as well as emotional factors along with the physical symptoms works best in the long run. They include simple lifestyle changes along with dietary modifications, weight reduction, and stress relief through exercise, yoga, meditation, natural herbal treatment and emotional and mental health.